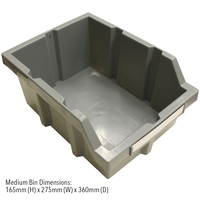 Set of 3 Medium Size Grey Bins for the 8 Shelf Bin Rack. These storage bins also fit on any standard sized shelving unit and can be used anywhere else as a general purpose storage bin. Set of 3 Medium Size Grey Bins for the 8 Shelf Commercial Bin Rack. These storage bins also fit on any standard sized shelving unit and can be used anywhere else as a general purpose storage bin. 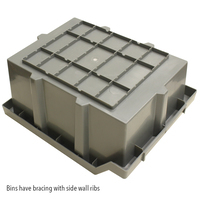 These polypropylene bins are a custom-fit for the 8 Shelf Commercial Bin Rack. All Maxim HD products come with a 12 month warranty.